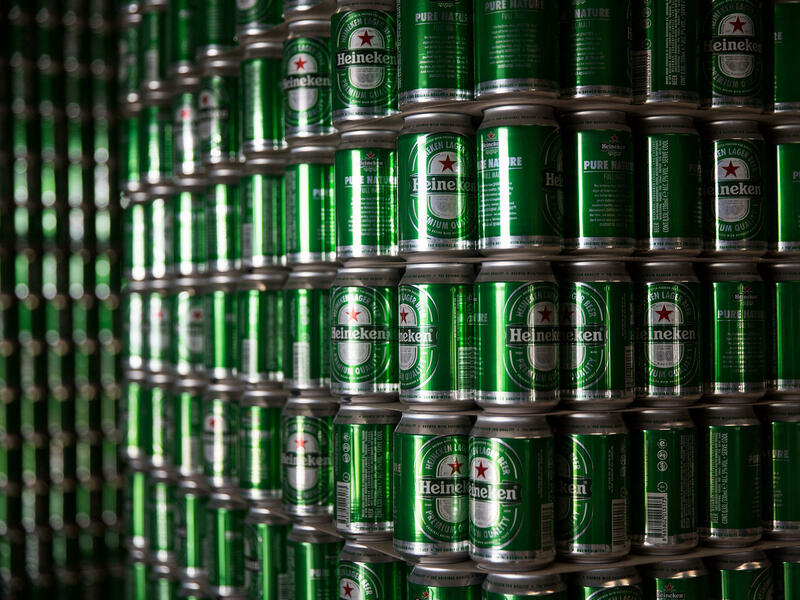 Heineken has bottling plants around the world. Peter Sands took over this month as the new head of the Global Fund to Fight AIDS, Tuberculosis and Malaria. But before he'd even officially taken his seat at the Fund's offices in Geneva, he was under attack for a new partnership with Heineken. In January at the World Economic Forum in Davos, the Global Fund announced it was partnering with Heineken to "fight infectious diseases in Africa." The world's second largest beer company will help the Global Fund with the delivery of health-care supplies in markets where Heineken already has an extensive distribution system. A coalition of global health organizations, however, many of whom focus on alcohol and drug abuse, called for the Global Fund to cancel the Heineken alliance. In an open letter to Sands, who supported the deal, the health advocates said alcohol is a major risk factor for the spread of HIV and TB. They also said alcohol adversely affects development efforts such as "poverty eradication, health for all, gender equality, economic prosperity, sustainable consumption, ending violence and building safer and resilient cities." They also believe that the partnership creates a conflict of interest. One part of the beer company could be working with local health ministries to improve their pharmaceutical distribution networks while another part of the company could be working against those same ministries to potentially block new alcohol control measures. "We very much see this as an incompatible partnership for global health," says Katie Dain, the CEO of the NCD Alliance, a coalition of groups that focus on non-communicable diseases, and one of the lead authors of the open letter condemning the Heineken/Global Fund deal. "What this partnership is doing and what we are really concerned about is that it's giving a halo effect to an industry that really isn't supporting the health of people in Africa," she told NPR. Seth Faison, head of communications at the Global Fund, said in an email to NPR that the fund need to get away from "business-as-usual" if the world is going to reach its goals of eliminating AIDS, TB and malaria by the year 2030. And he said Heineken can help them reach those ambitious targets. "Specifically, Heineken can provide expertise in demand-forecasting and quality control during shipment, data management and supply chain logistics," he wrote. "Bottom line, it's about getting lifesaving medicines and other health supplies where they are needed, when they are needed." Africa is one of Heineken's fastest growing markets. The Dutch beer giant has 45 breweries across the continent. It just opened a new plant in Ivory Coast and is building another one in Mozambique. But the business model isn't strictly business. Beer companies, including Heineken, have a long history of philanthropy in Africa, sponsoring sports teams and underwriting civic events. And Heineken has promised to buy at least 60 percent of its raw materials locally for its Africa operations by the year 2020. Heineken turned down a request for an interview about this new Global Fund partnership controversy but in an email said, "[The partnership] gives us an opportunity to bring our supply chain and marketing expertise to help the Global Fund reach specific target groups that otherwise would go underserved." Pepsi has donated millions to Save the Children to fight malnutrition in India and Bangladesh. UNICEF announced an agreement in 2016 with the food, beverage and consumer goods giant Unilever to expand access to clean drinking water in four African countries. Stella Artois is currently working with Water.org. The Global Fund has set up a program with Coca Cola called Project Last Mile that's very similar to the Heineken arrangement. Project Last Mile offers logistical support for the distribution of medicines and health-care supplies in Africa. "The perception that Project Last Mile is about putting meds on Coke trucks or putting condoms in Coca-Cola cases, that is not really what the project is about," says Erika Linnander, senior technical officer at the Global Health Leadership Institute at Yale University. Linnander says Project Last Mile really is about transferring institutional knowledge from a private company, Coke, to the public health sector in eight African countries. For instance, Coke's supply chain managers in South Africa helped the ministry of health set up a new network to distribute HIV medications. The goal was to allow patients to pick up their government-issued meds in more convenient places, like post offices and private pharmacies. "Of course that's what Coke does really well," Linnander says. "They engage with all these kiosks all across the country and get their product onto all different kinds of shelves. So they [Coke] helped with the strategic planning on how do you push your product, these meds, out to other pick up points." Linnander has written evaluations of Project Last Mile She says Heineken would probably bring similar logistics expertise to its partnership with the Global Fund. Linnander adds that the partnership with Coke has also been controversial at times. Some local politicians have questioned why Coke's motives and whether the program is appropriate. Coke has been criticized by public health officials in many parts of the world for contributing to the burgeoning diabetes problem. Linnander says she's given this a lot of thought herself. "You know, I work in a department of global health," she says. "I think it's useful to be transparent about the potential business benefits to Coca-Cola, mostly just in terms of goodwill and branding and things like that. If this we're a nutrition intervention I think I would feel very differently and very uncomfortable. But this [Project Last Mile] typically is about supply chains." The criticism of the Global Fund/Heineken partnership, however, continues. The influential medical journal The Lancet just came out with an editorial saying Sands should scrap the Heineken alliance. The editorial says the new head of the Global Fund with this partnership is "alienating large parts of the global health community." John Norris, a senior fellow at the Center for American Progress, has written a lot about public private partnerships in international development. He says these associations can be difficult politically but he argues that global health advocates are better off engaging with the beer industry rather than declaring Heineken too toxic to stomach. "A lot of the philanthropies that are now very much mainstream sprung up from robber barons who made their money in lots of unsavory ways," he says. "I can certainly understand a legitimate grievance coming from the community that deals with noncommunicable diseases worried about a company that sells alcohol being involved with the Global Fund. But you know, we now live in a world that is so interconnected, we need to figure out how to have companies inside the tent." Every charitable group relies on a helping hand. Do some partnerships, like the Heineken-Global Fund arrangement, cross the line? Share your thoughts in the tool below by Tuesday, March 20. We'll post some of your responses on the blog next week. Read a selection of responses from this question in this blog post.